Can Santa Save The United Methodist Church? It was an unexpected encounter when we arrived at the church. 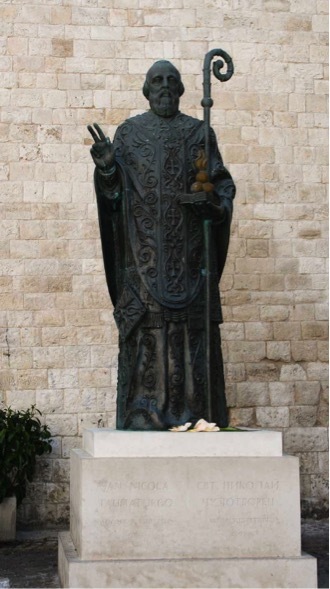 For though I knew all the legends about the famous bishop of Myra—how others marveled at his generosity and kindness—I hadn’t realized that when the Saracens conquered Turkey where Myra was located, that his bones were actually stolen and brought to Italy for “safekeeping,” ending up in the southern coastal town of Bari. And there he quickly displaced the first “patron saint” of that community as the new and more famous one. It’s said, in fact, that when his remains arrived in Puglia in 1087 that the animals pulling the ox cart to carry his coffin to the existing church suddenly stopped and refused to go any further, and so a new cathedral, the Basilica de San Nicola, was built on that very spot near the harbor instead. With two large towers that frame the façade, it is an impressive place indeed, and it’s easy to see how the church has also been used as a castle throughout the years. What first caught our attention, however, was the large statue in the courtyard outside. For inscribed in both Italian and Russian is the explanation that the bronze monument was a gift ten years ago to Bari from none other than Vladimir Putin in honor of the wonder-working saint and of the age-old desire for all to live in peace. And when we went inside, we were delighted to hear not only a Roman Catholic choir singing at a wedding being performed in the main nave, but downstairs to hear the equally sweet chants of Orthodox monks surrounding the tomb where the saint’s relics are buried. For many decades ago, the basilica became home not only to a Catholic community of Dominican friars but to an Orthodox chapel as well. It is a fitting tribute indeed thus to the venerable Nicholas who has become everyone’s saint, bringing together Christians from both East and West to confess one God—the Father, Son, and Holy Spirit. As I stood on the stairway between the two groups simultaneously singing God’s praises, though in different tongues and different styles, I wondered whether or not St. Nicholas the Wonder-Worker might have one more miracle left within him. For if he can bring together both East and West, Orthodox and Catholic, Italians and Russians, is it possible that if we adopt his spirit of generosity and selflessness that even United Methodists who disagree on so many things might be able to live under the same roof still? To be sure, there are significant differences between traditional conservative Methodists and those who favor more progressive views, focused on questions of full inclusion and human sexuality, but rooted as well in differing understandings of scriptural authority and biblical interpretation. But a millennium ago, just before the remains of Nicolas arrived in Bari, the differences between the Eastern and Western portions of the church were far greater, with Pope Leo IX excommunicating the Orthodox Patriarch Michael Cerularius in 1054 for “trying to humiliate and crush the holy catholic and apostolic church,” followed by the Patriarch then excommunicating Leo. Before we leave yet another Christmas season entirely, thus, perhaps there’s yet a lesson to be learned from the example of the ancient saint who spent all he had on others. As we enter into a year of discernment for our church’s future, here’s hoping Santa will bring all of us the gift of kindness. 3 Responses to Can Santa Save The United Methodist Church? Wonderful message of peace and unity. Thank you. I truly appreciate your informative and thoughtful messages. Happy New 2018 to you and yours.